Santiago, who goes by “Santi,” is seven. He has recently learned the phrase “Come on!”. It is a useful English phrase for a Costa Rican child to learn, especially one who is surrounded by American college students. Santi has endless energy. His buzzing imagination is always coming up with a new game to play. Playing hockey in my host family’s living room can be exhausting when the humidity is heavy and the heat seeps deep into your bones. 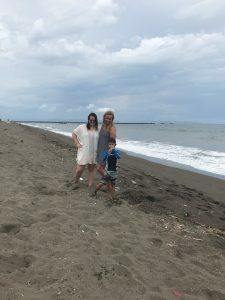 But after I left Costa Rica in January of 2017 I longed for those long nights running around after Santi, talking about life with his parents over a cup of coffee, and jumping up on a chair when the inevitable frog appeared in a corner of the kitchen. When I returned to Miami for the spring semester my heart was still in the small Central American country. As I sat in my history honors class, trying to come up with an idea for my thesis, the scent of vigorones wafting onto the beach and the friendly face of the owner of my favorite smoothie stand were still fresh in my mind. So I did what I do best. I followed the research rabbit hole and uncovered a rich and fascinating history. Most Americans know little to nothing about the history of Costa Rica. Most don’t know that the small country fought a short Civil War in 1948. It was an earlier conflict in the Cold-War era of Latin America. I dug further and found that the Popular Vanguard Party (PVP), formerly known as the Communist Party of Costa Rica, was a major actor in the forty-four day conflict. Opposing them was the United States-backed National Liberation Army, the winning side. Within the PVP, women, especially teachers, played a large role. I had my topic. I would research women and activism in Costa Rica in the era leading up to the Civil War. 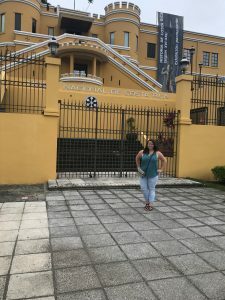 Within just eight months I was able to return to the country I had fallen in love with to conduct research for my senior history honors thesis. 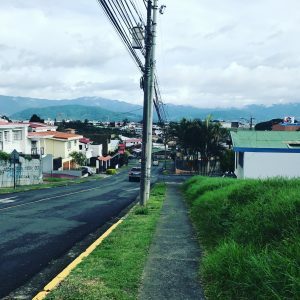 This August I spent nine days in San Jose, Costa Rica’s capital, digging into the country’s past. Most of my time was spent delving into documents from the early twentieth century in the country’s National Archives. I also visited a couple museums, the National Institute of Women (INAMU) and the National Public Library for my research. Throughout my journey I acquired a rich collection of both primary and secondary sources. 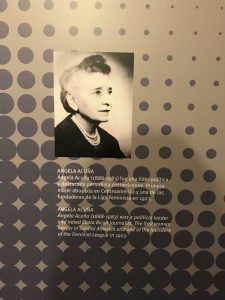 I dug into the writings of political activists Carmen Lyra and Luisa González, uncovered government communication regarding communist activity, learned about the legacy of these women, and fell in love all over again with Costa Rica. When the Archives were closed for the weekend I headed to Puntarenas to visit my host family, my original inspiration for this project. It was a bizarre feeling to walk the streets of the sleepy beach town again. I hadn’t expected to return here so soon after I left. The reunion with my host family was a joyous one. They met my sister Cara, my travel companion. I cherished the short time I spent with my familia tica. It felt right to re-visit the place and the people that had inspired my research. The great thing about historical research is that I visit Costa Rica every time I sit down to work on my thesis. The way I see it, I get to spend my senior year in the beautiful country, even as I sit in King Library. Pura Vida. A candid shot captured by my host father of myself (left), my sister Cara who is a sophomore a Miami (right), and my host brother Santi (front). Santi hates pictures and wants to return to building his castle and playing in the waves. San Jose is nestled in a mountainous region. The walk to the Archives from my hotel was less of a walk and more of a hike but there were gorgeous views of the city and the surrounding landscape. 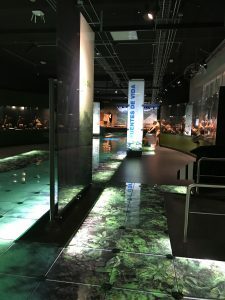 In the midst of one of the torrential downpours that San Jose is famous for we popped into the Jade Museum, which is devoted to Pre-Columbian history of Costa Rica. The indigenous population that inhabited Costa Rica prior to the arrival of the Spanish created tools, art, and jewelry out of jade found in the region. This is a photo of myself outside the National Museum in San Jose. The museum is housed in a military fort from the early twentieth century. After the 1948 Civil War Costa Rica abolished its military with hopes of a peaceful future. I was excited when I found this photo in the National Museum of one of the women I am researching. 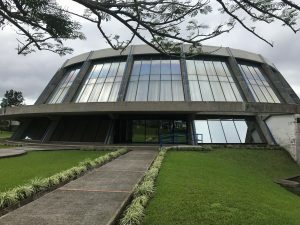 The Archivo Nacional de Costa Rica, the National Archives in English, resembles a spaceship but the building is devoted to housing documents from Costa Rica’s past. I spent most of my time here digging up Costa Rica’s fascinating history. 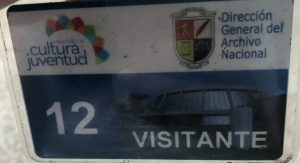 This is my visitor pass that was needed for entry into the National Archives. My Spanish skills certainly grew through interactions with archivists. I am now Facebook friends with a woman who works in the Archives. 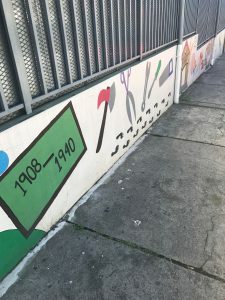 The Franklin D. Roosevelt Elementary School in San Jose is decorated by this painting of the history of the school. My research focuses on women teacher activists so it was amazing to see an artistic work depicting Costa Rican educational history. Clash of cultures! Throughout the twentieth century, the Costa Rican Communist Party was in contact with communist parties from around the world, including nearby Mexico. 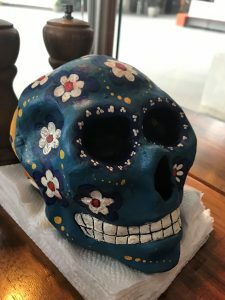 My sister and I dined at a Mexican restaurant in San Jose where I photographed this painted skull decoration, associated with the Day of the Dead. We ate pan de muertos, the Mexican bread consumed on the holiday. 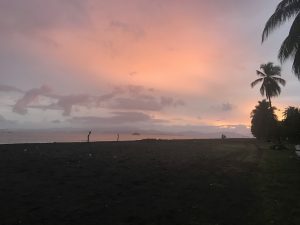 Though I was in Costa Rica during the rainy season, I was still able to enjoy one of Puntarenas’s signature sunsets. As the ticos (people of Costa Rica) say, pura vida or life is good.